I’ve been wondering lately what should be my next modification to the bike. I’m keen to get a tank bag, and I’d also like to get the electrics sorted out and a GPS added, but I found out last week that the top priority is going to have to be the windscreen. Last weekend I rode 150+kms from the eastern suburbs of Melbourne to Ocean Grove, on mostly highway and freeway. The ride itself was pretty good, despite some cross-winds on the Western Ring Road, but the buffeting from the windscreen was terrible. I actually didn’t realise how bad it was until I stood up on the pegs at 90km/h and found that my helmet had gone quiet and I could hear my iPod better. The difference was incredible. Being out in the wind with no protection at all was far better than riding behind the stock screen. There are two main schools of thought with windscreens, it seems: higher is better, and the airfoil approach. The taller screens range from the Kawasaki +4 (inch) screen through to the Cee Bailey monster. Some screens continue the contour of the stock screen and fairing, while others curve up to “flick” the airstream over the rider’s head. If I were to go for a taller screen it would be a curved one. The idea of a tall screen sitting closer to my head doesn’t thrill me, and something that directs the wind up and over me just makes more sense. The airfoil screens come in two flavours. The Laminar Lip (an early favourite) attaches to the stock screen and curves up to a taller angle, creating a “flick” and a low pressure area between the two screens. I like the idea of this, and that it can be easily removed, leaving the stock screen intact. Wile the total assembly is taller there’s no means of adjustment, so if it doesn’t do the job… tough. The Vario Touring screen works on a similar principle to the Laminar Lip, though the kit includes a replacement for the stock screen plus an adjustable airfoil or spoiler. The Vario doesn’t add any height to the screen, and the airfoil area is actually fairly small. What I do like about it is that the pitch of the foil can be adjusted to suit the height and riding position of the rider. The problem I have with all of these is that I don’t know if any of them will work. I’ve read positive and negative reviews of all of them, and it seems many people have bought more than one before they’ve found the right screen for them. One guy has the Kawa +4 with a Laminar Lip, others have the Cee Bailey or CalSci tall screens. The one that intrigues me the most is the Vario. I like the fact that it’s adjustable, meaning it’s not as hit and miss as the fixed solutions from other vendors. The Australian distributor of the Vario was not aware that there was a screen for the new KLR (MRA’s own site doesn’t list it, so it’s hardly their fault), but they can order them in for around $AU250. Won’t be next week, but it will be soon. I’m also pleased to report that the de-restriction mods performed a few weeks ago are behaving nicely. Power is up, particularly at lower revs, and if anything fuel consumption is down. My last tank (mostly highway riding) saw 385km to reserve, which is the best result I’ve had yet. This looks like an interesting setup. 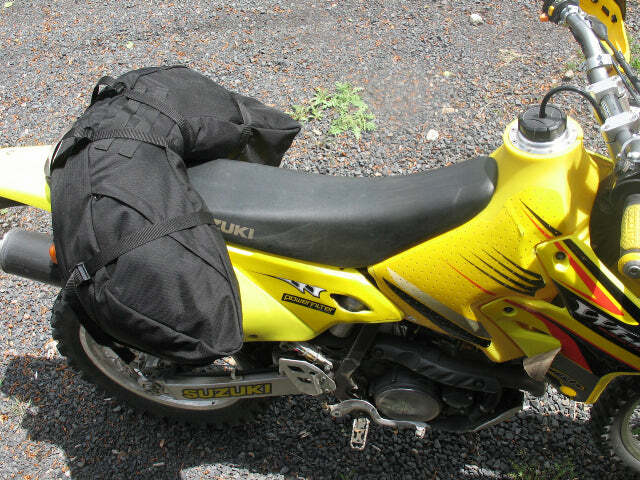 The Giant Loop is similar to the Wolfman Alpha and Beta bags, but is designed more for lighter dirt bikes. The bag appears to have a rigid inner liner on the underside, which gives them a little more shape than the Wolfman, particularly when they’re empty. The side parts also seem to hang with a forward lean, so the top of the bag is at the back of the seat, while the sides rest on the side covers of the bike, rather than the exhaust. I’m not sure I understand the value of mounting the bag to the bike with screws, as the video and photos on the site suggest. I know they want the bag to move with the bike, but a mounting system with no give at all seems to be over the top, and probably self-defeating, The front and rear straps on the Wolfman give the same level of connection, but with more flexibility. Apparently there’s a KLR-sized one in development… not that I’ll be buying another tail bag any time soon.